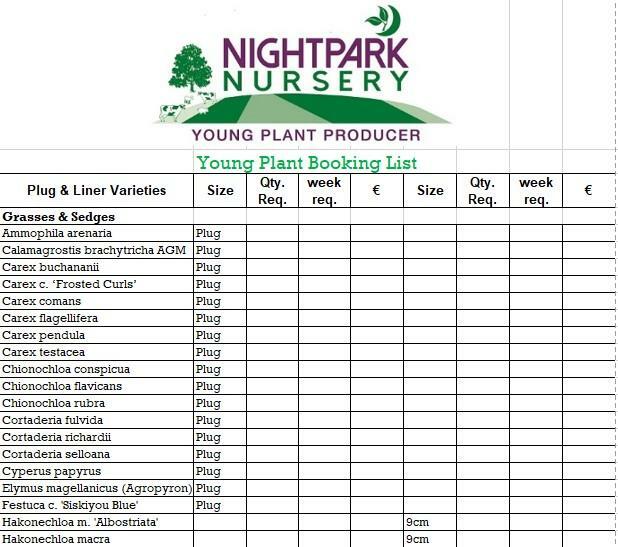 Nightpark Nursery young plant catalogue. Our plant availability list is emailed monthly to those on our contact database. Please contact Nightpark Nursery at info@nightparknursery.com to add your contact details if you would like to receive these regular updates. You can also fill out our form on the contact/location page. Our somewhat unusual range of plants offers growers plenty choice to keep the plant-buying customers interested. We carefully select the plants we grow, with an eye to latest trends as well as reviving the reliable garden plants which will perform well in our increasingly challenging climate. The full selection of ‘plugs and liners that we’ grow is listed on our Booking list. This list is updated periodically but is usually issued in Autumn. Our fully updated 2019 booking list is now available for download. -see column opposite. We offer a large range of grasses & sedges, perennials, ferns, woodland plants and also selected woody species. From time to time, we get involved in various projects that need specific plants, we like these challenges!. We also produce many lesser known species of plants such as Native plants/Wildflowers if they are required for special projects. These are contract grown according to the customers requirements. We are happy to quote for your young plant requirements or to discuss contract-growing of specific plant lines that might not be listed. Contact us at Nightpark Nursery. We mostly despatch plant orders on Danish (CC) Trolleys. A full Danish trolley holds approximately 2500 plugs or 900 9cm pots. Our minimum order value is €250. We do not sell to members of the public. Download our plant list now. It is possible to download our availability lists direct from here. Download Nightpark Nursery Availability list UK (Stg/£) - Please use Euro list above. If you are having problems downloading the list, please let us know by submitting a query through the contact form. We can also email you the PDF version of the list if you prefer that format.